Sgt. Pepper is a 2-year-old, white and fawn male born June 2006. His right ear is legible, but his left ear (bruised on the inside and covered with freshly applied green ink when he arrived) is still not clear at all. He was found as a stray and picked up by the North Texas Humane Society in very bad condition. 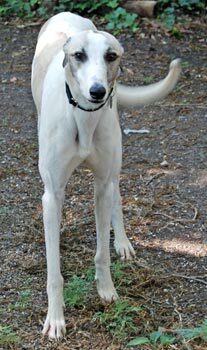 He tested positive for Ehrlichia, Babesia and Lyme disease, and had a reaction to ProMeris given him at the shelter. Dr. Jeff Ellis and Dr. Christy Soileau of VCA Preston Park Animal Hospital prescribed a 10 week treatment regime for Sgt. Pepper , to which he responded very quickly . He has been successfully treated for his tick diseases, and has completed all his final medical procedures. Sgt. Pepper is ready to find his forever home! He is cat and small animal tolerant. 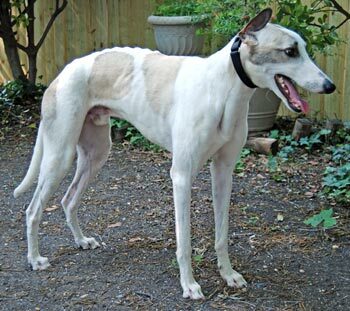 Sergeant Pepper has made many greyt gains since coming under the care of GALT. He's gained weight, health and many new experiences in his foster home(s). His trust of humans has made greyt strides, too. He still sometimes doesn't come when called, but with enthusiasm to play or a little treat, he's learning. He truly wants affection and will nudge his way through the other dogs to get some when he sees that they're getting hugs, kisses, ear rubs and petting. 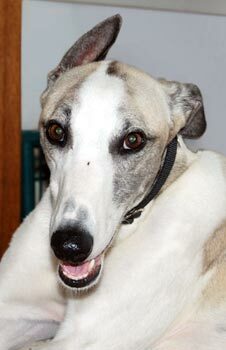 Very sweet boy, as is the nature of most Greyhounds. Pepper's main nemesis is the vacuum cleaner. He'd rather face a driving rainstorm complete with thunder than be in the same room with the vacuum cleaner, turned on or off. So we know he's not afraid of thunder, anyway. He usually just goes to his crate when the floor cleaning commences. Pepper likes his crate and is a little bit of a loner that way. He?s welcome to a dog bed in my bedroom at night with the rest of the dogs but prefers his crate. Sure, he'll lay on a cushy dog bed near the human of the house, like now as I'm writing this. Pepper loves to play with toys and remove all stuffing and squeakers. He will also go frolicking around with a tough plastic squeaky ball. Mealtime is his favorite time and he gets very excited and playful, barking and tossing toys in the air. He gets fed in his crate and will run to it and make pawing gestures with the gate like he knows he gets to eat when it's closed. Normally, I wouldn?t close it, and would gradually move the foster dog's bowl out of the crate to his own "feeding station", but Pepper eats a bit faster than the others and then wants to help them finish theirs. This well-intentioned gesture is not well-received, but all other times he gets along well with his foster sibs - two Greyhounds and an old terrier mix. Pepper lives with two cats. One is dog savvy and OK with Pepper giving him a half-hearted chase to beneath the dining room table. The other is fairly new and having to come out of her own shell, slowly learning about the big scary canines that are so curious about her. Pepper put a curious nose forward to check her out and was promptly met with a hissy-fit and claws flying. He backed off quickly and looked perplexed when the cat ran to hide. No chase, just a look. However, he has since been the only dog of this household to actually get her walk up to him to touch her nose to his! Gently making new friends, those two. Do you have a big, gentle heart for this sweet, gorgeous boy?